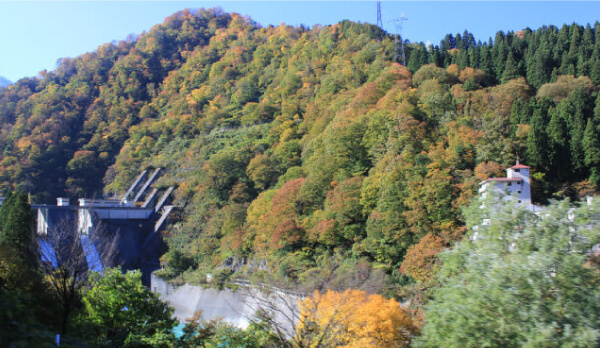 Unazuki St. Kuronagi St. Kanetsuri St. Keyakidaira St.
Unazuki DamCompleted in 2001, this is the newest dam in the Kurobe Gorge area. 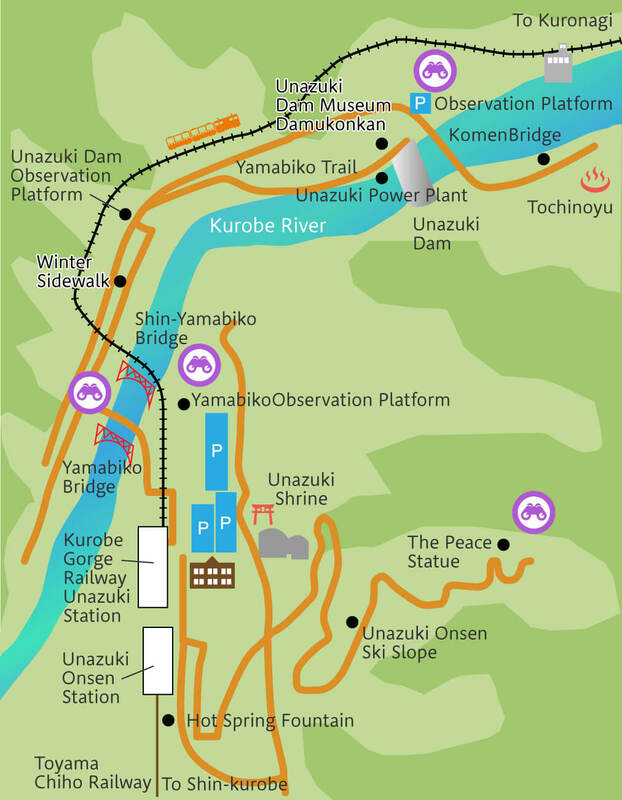 It is a multipurpose dam designed for flood control, electric power generation and other aims. 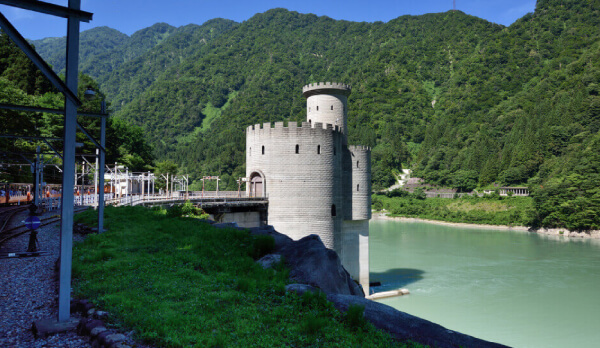 Shin-Yanagawara Power PlantThis hydroelectric power station that resembles an ancient European castle is located on the shores of Lake Unazuki. 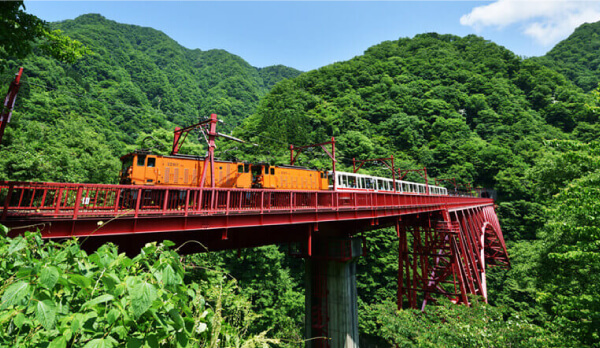 Shin-Yamabiko BridgeAfter leaving Unazuki Station the Torokko Electric Train first crosses a bright crimson steel bridge. 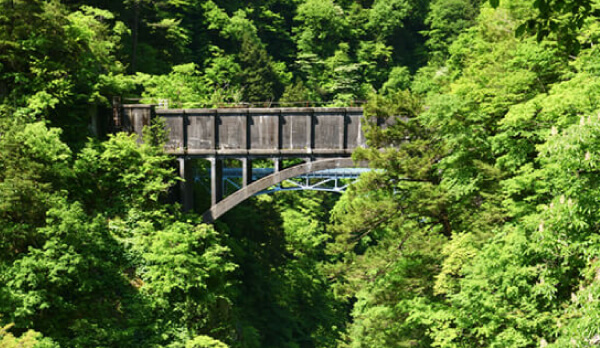 The name (yamabiko) was earned by the fact that the sound of the train passing by echoes in the hot springs town. 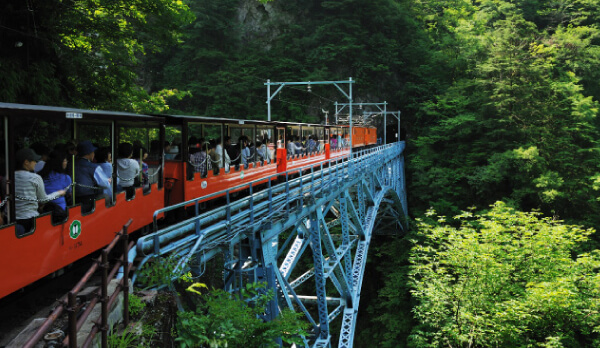 Atobiki Bridge At a height of 60 meters and a length of 64 meters, this bridge spans the steepest and deepest valley along the rail line. 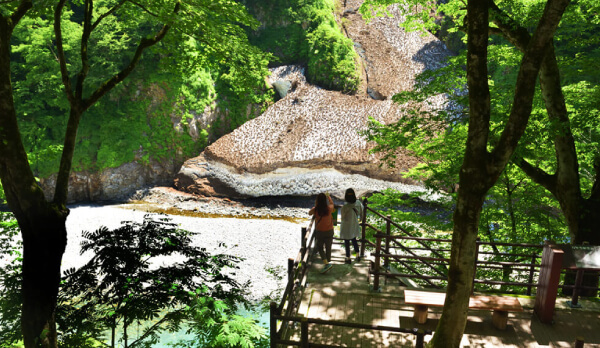 The name is derived from the belief that previously mountain climbers would inch backwards away (atobiki) when they came face-to-face with such a seemingly bottomless valley. 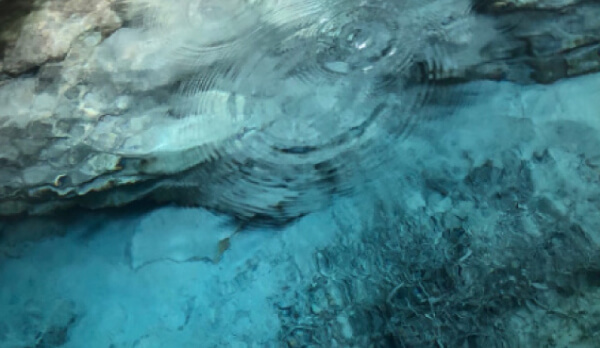 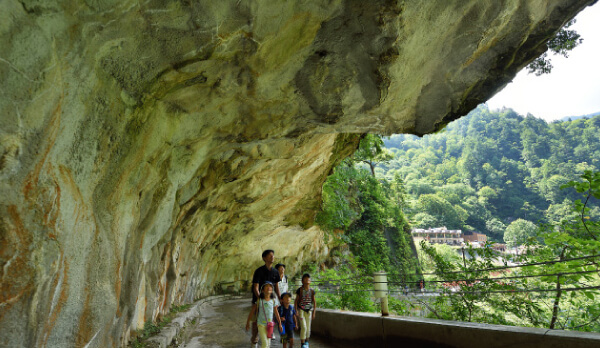 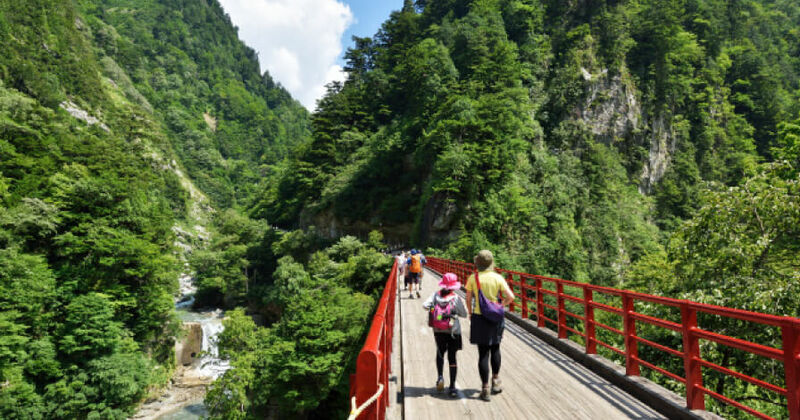 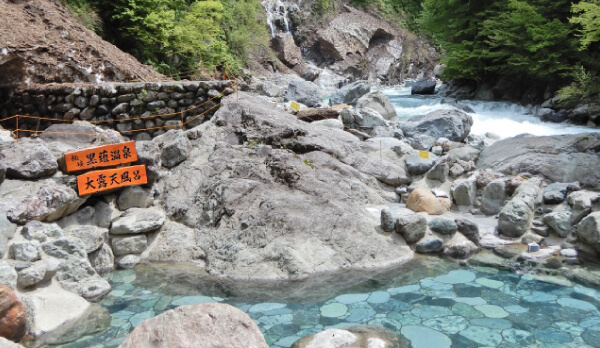 Kanetsuri Kawara (Riverside Open-Air Hot Springs)At this spot you can enjoy both the limpid waters of the Kurobe River and a secluded hot spring. 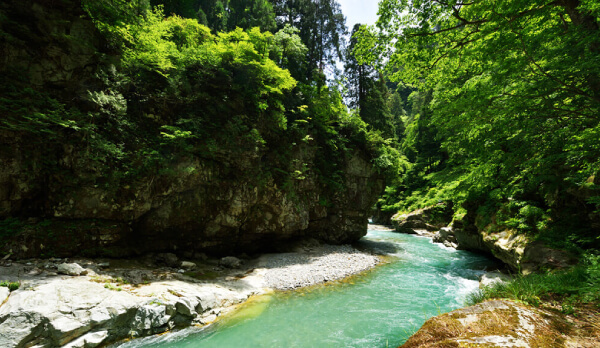 The waters that gush out in the outdoor bathing area alongside the river are justly famed. 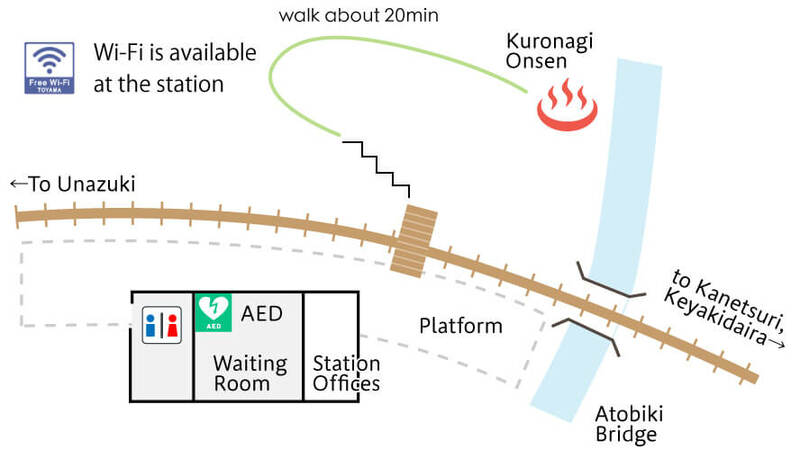 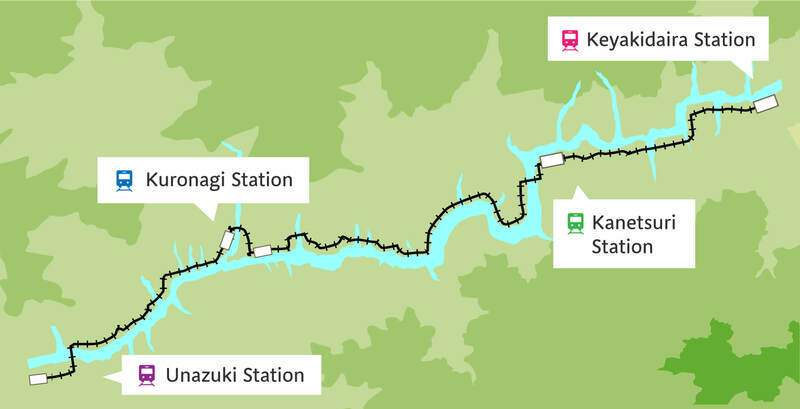 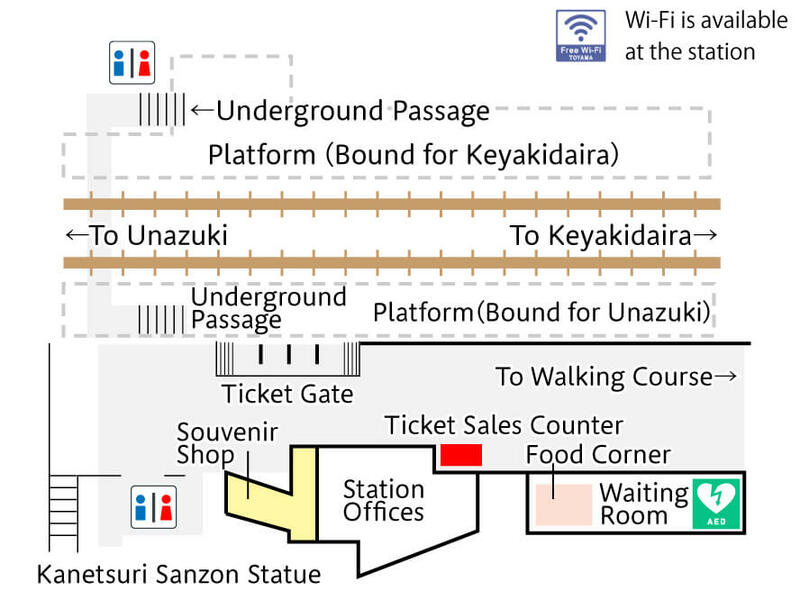 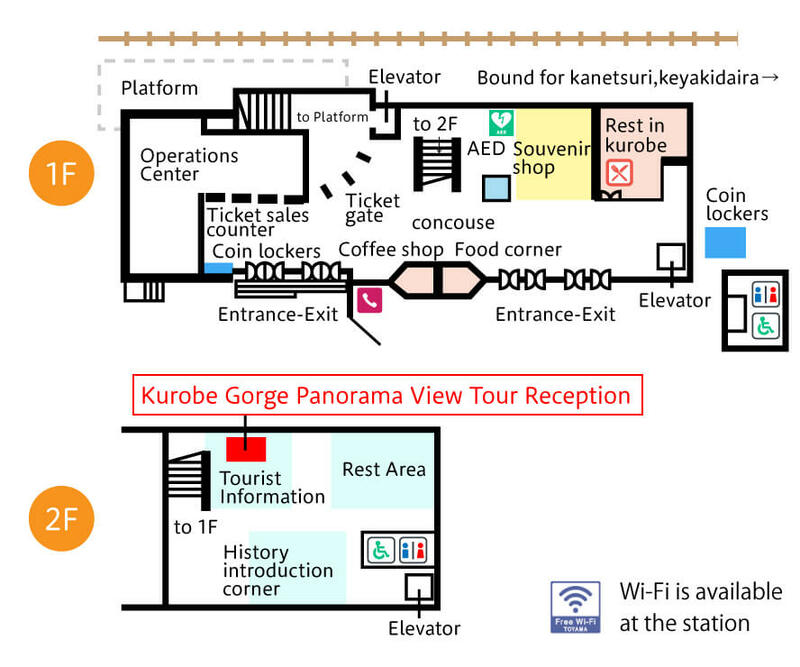 (Kanetsuri Station→500 meters, around 15 min.) 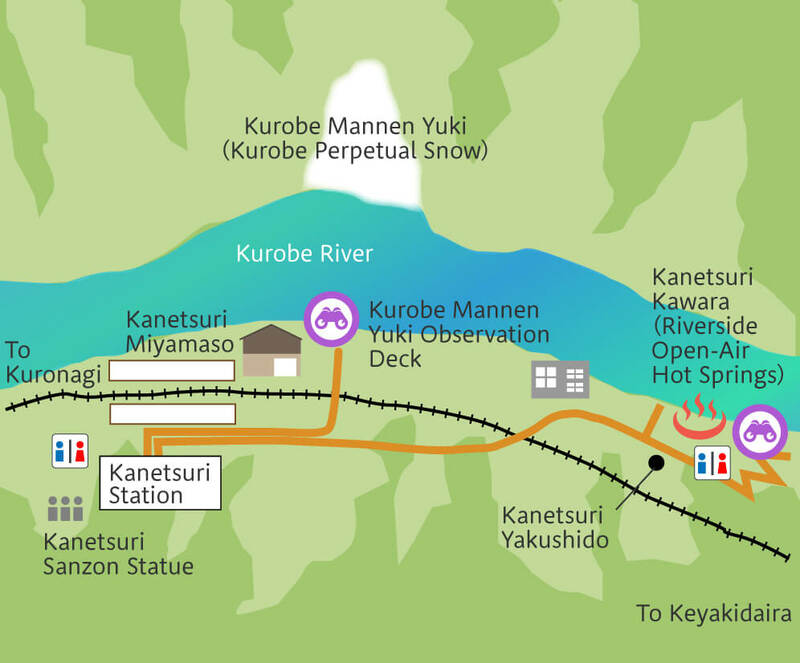 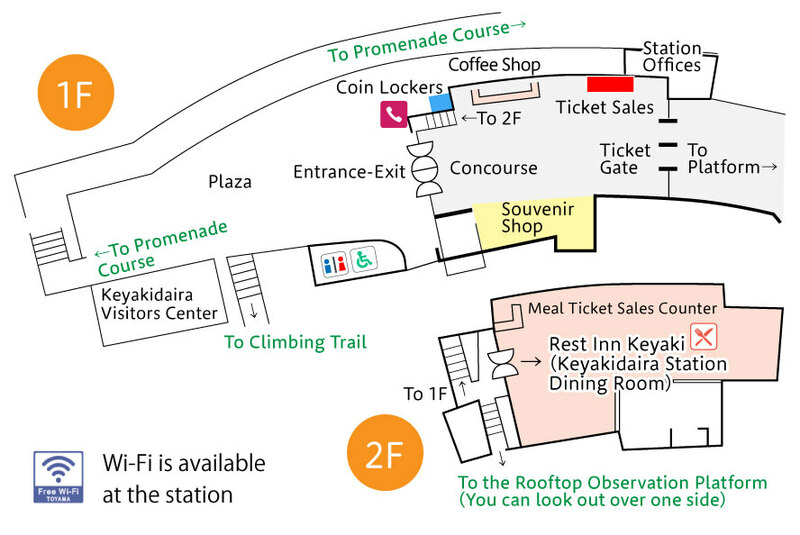 *After 4:00 p.m. use of this hot spring is limited to overnight guests. 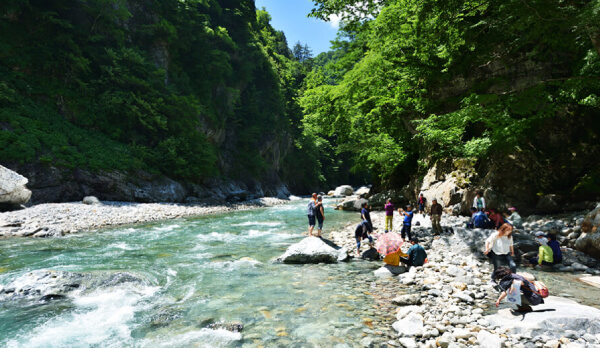 Riverside Viewing Platform,Foot Bath From this viewing platform, you can enjoy the marvelous sights of Mt. 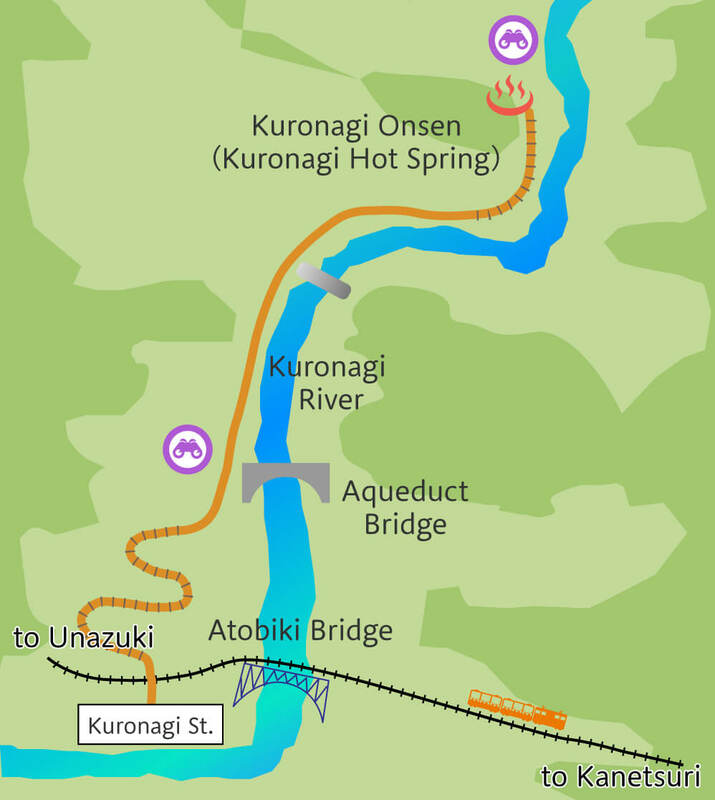 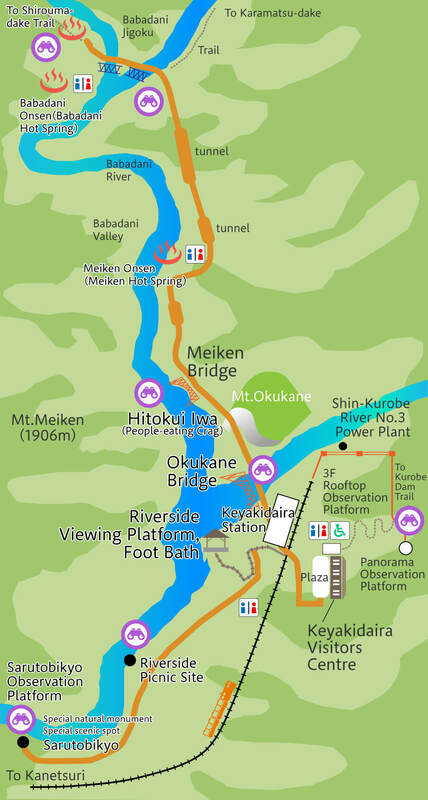 Okukane and Okukane Bridge. 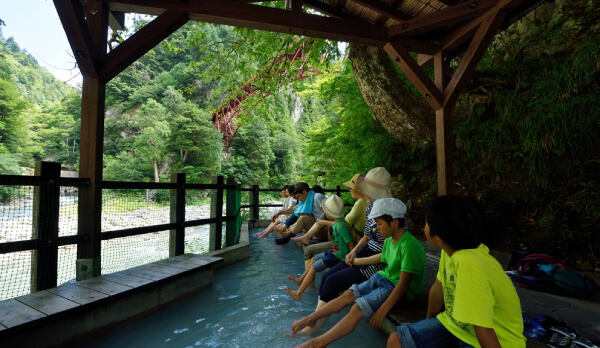 And if you want to get rid of travel fatigue, be sure to make a beeline for the foot bath.